Pedanius Dioscorides (in ancient Greek Dioskorid�s), was born about 40 AD at Anazarbus in Cilicia (in modern Turkey) and died about 90 AD. He was a Greek physician, pharmacologist and botanist. His work was the main source of knowledge on medicinal plants in the ancient world. Dioscorides exercised great influence throughout the Middle Ages until the sixteenth century. We know little about the life of Dioscorides. 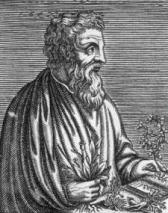 The only information we have is the preface to his De Materia Medica (which means, in Latin, “Regarding Medical Matters”) a five volume treatise on the medicinal use of plants written about 60 AD, which suggests that he was a medical officer in the reigns of the Emperor Claudius and the Emperor Nero. Dioscorides traveled extensively and this enabled him to collect extensive information on medicinal plants collected from all corners of the Roman Empire and the Greek world. De Materia Medica is, without doubt, the book of herbal remedies which had the greatest influence in the history of this discipline. In it, Dioscorides described the medical use of 1600 products; about three-fifths plants, the remaining animals and minerals. It gives the popular name of each species, and briefly, shows their virtues and how to harvest them. Dioscorides tries to give, when possible, their geographical distribution. Subsequently, other authors or physicians added to his work by appending the synonyms of Greek plant names in major languages of the Mediterranean. This is a link to an online edition of De Materia Medica. Dioscoride’s work was widely known and published throughout the Roman world and beyond. Several Indian and Arabic translations of his work have been found. De Materia Medica is primarily a medical textbook. Dioscorides prefers direct observation to the repetition of hearsay and folk tales; and shows an unusual, for the time, tendency to critique the work of earlier writers, even when these enjoyed a considerable reputation. De Materia Medica is important not only for the history of botany: it is a repository of the knowledge of herbs and medicines used by the Greeks, Romans and other cultures of antiquity. His work has preserved the names of plants and substances in dead languages and dialects that would otherwise have been lost. Unlike many classical authors, the works of Dioscorides were never lost during the Dark Ages, and thus was never “rediscovered” during the Renaissance. The book of Dioscorides never ceased to circulate in Europe and even the Moslem world. The oldest illustrated copy of this treatise was discovered in Istanbul in 1560 (it is likely that the illustrations come from Rhizotomikon of Crateuas) and is today preserved in Vienna. This Codex Constantinopolitanus shows the author’s enormous interest in plant identification, providing a large number of illustrations in color and lists of synonyms for most plants. A large number of manuscripts, some of them very old dating back to V-VII century, evidence the widespread use of the work of Dioscorides. Many of these hand copied manuscripts were “updated” with commentaries in the margins by later herbalists. These additions are important in their own right, because they shed light on the state of medical knowledge during the Middle Ages and beyond. Some manuscript versions contain additions from Arab and Indian sources, allowing us to gain an insight into the herbalist’s art in the Moslem and Indian worlds. In nature’s secret lore” (The Inferno, CANTO IV, Cary Translation) or “the good collector” (in Longfellow’s translation of the same passage).